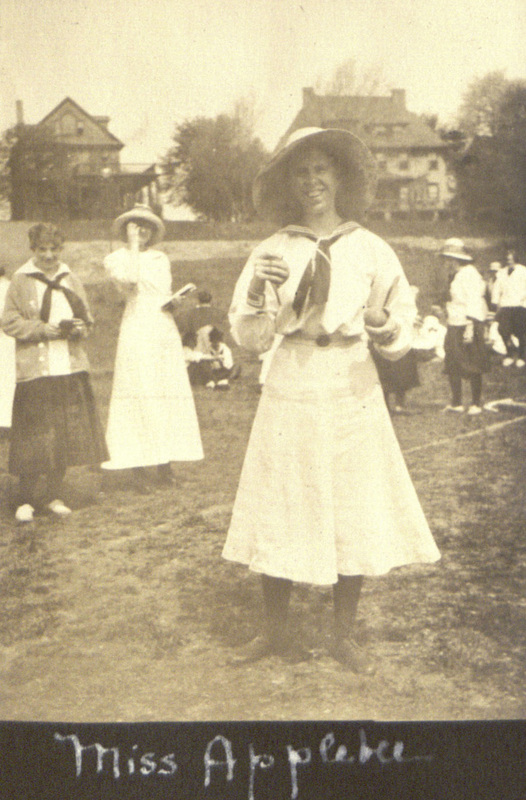 Constance M. K. Applebee at a track and field competition, circa 1914, from the Photo Album of Ida. W. Pritchett. Applebee was, by all accounts, a character and a phenomenon, and for many Bryn Mawr students was one of the most memorable and influential aspects of their time at the college. Her papers contain scores of letters and notes from Bryn Mawr alumnae praising her. she wanted the hockey players to use their brains and give quick thought to what they were doing, not relying solely on strength and speed, important as these were. She said all sorts of funny things when she criticized different members of the team, and never seemed to say the same thing twice. The player accosted knew right off what she meant and often remembered the words she spoke long afterwards… Her criticisms did not discourage me. I enjoyed her witticism. I adored her and thought she was just lovely. Most of the faculty lived an intellectual life by themselves, rather remote from the students. Miss Applebee, on the other hand, took a great interest in her ‘girls’, enjoying them all thoroughly. She was genuinely fond of us. Affectionately, we called her "The Apple" and often invited her to tea in our dormitories. She is the only faculty person I remember having been so invited. Some of the girls kept up their friendship with her throughout their lives1. Hockey is my pleasantest memory of college. Crisp sunny autumn days and Miss Applebee shouting don’t stand there Thomas admiring your shot, make another one. I still have scars on my shin bone from Adeline Havermeyer’s hockey stick, guard 1905, I right wing 19062.
those glorious days when a good tongue lashing from "The Apple" was the highest accolade B.M. [Bryn Mawr] could bestow. They were such glorious days because you made them so, in the standards you set, the ambitions and aspirations you inspired, and in the remarkable ability you had to make us give of our best on the field. I’ve forgotten most of all I learned in the classrooms but the lessons that I learned with you on the hockey field [are] a constant companion3. After 1928 hockey fell on rather hard times at college, and it upset me so that I found myself coaching my own classmates and all the classes below mine for two years, whenever I possibly could. I’ll never forget one friend who, overhearing me on the tower field giving tongue, asked “who do you think you are - the Apple?" It was a moment of such united pride and shame, because while I might have sounded like you - I could never be you. We missed you terribly. 1. Hinton, Carmelita Chase. "Letter to Applebee Memorial Service Committee, April 15, 1981." Folder 3, Box 1. Constance Applebee Papers, Special Collections Department, Bryn Mawr College Library. 2. Bennett, Jessie Thomas. "Telegram to Catherine McBridge, November 8, 1951." Folder 6, Box 1. Constance Applebee Papers, Special Collections Department, Bryn Mawr College Library. 3. Kirkland, Elizabeth Blanchard. "Letter to Constance Applebee, ca. 1951." Folder 6, Box 1. Constance Applebee Papers, Special Collections Department, Bryn Mawr College Library.